Russell Westbrook needed 22 minutes to get on the board. It didn’t matter, because the Thunder have that other guy, too. 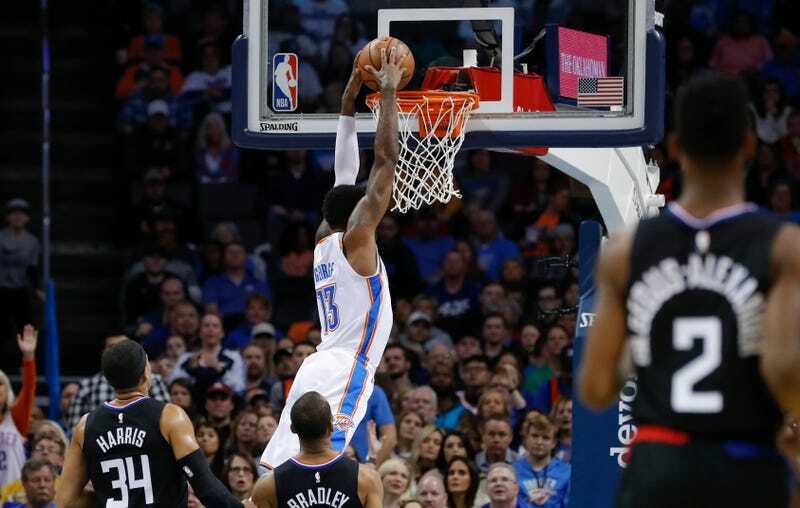 Carrying the scoring load for Oklahoma City once again was Paul George, who went off for 33 points, seven rebounds, and six assists, with no turnovers. Behind another wild December night from the fringe MVP candidate, the Thunder took down the Clippers 110-104 Saturday and improved to 18-10. George’s velvety ball-handling and shot creation gives the Thunder a lot more of a margin for those rough games when Westbrook falters. George had a near-ideal offensive outing, getting 15 of his points behind the arc (on 5-of-9 shooting), another six points at the rim, and another six at the stripe. When the Clippers threw traps at him to slow him down, George briskly made all the right reads; sometimes he’d even clean up the mess himself if necessary. The Thunder are stocked with more complementary offensive pieces—think burly rim runners like Steven Adams and Jerami Grant—so when Westbrook is getting his rest, George tends to command the majority of the defense’s attention. Dennis Schroder notwithstanding, it’s often on George to make something happen. That added defensive attention didn’t seem to faze him much. In fact, that lineup with PG going solo—George-Schroder-Adams-Grant-Ferguson—posts a net rating of 6.8, a hair better than the Thunder’s second-best lineup, which swaps Westbrook back in for Schroder for a net rating of 4.6. Both squads see the floor 13 minutes a game; staggering the stars has paid dividends. “I’m fine being trapped,” George told reporters after the game. “Honestly, I think that’s the easiest way for me to get myself going because I make those plays early. And we burn them, we hurt them on those plays. They can’t trap me anymore.” If he’s navigating that pressure well, the Thunder offense—which can tend towards stagnancy—can find quality looks in the paint. At the moment George is in complete control of his craft, with the lowest turnover rate of his career. The Thunder has shaken off a grim start and settled on a clear identity, which runs somewhat counter to league-wide fashions: short on shooting and space, long on menacing defensive limbs, and heavily dependent on the ingenuity of its two superstars, who are learning to share the load. Three months into the season, Westbrook is averaging a whole triple-double, and he’s not even the best player on his own team.